The 2018/2019 Cork GAA Clubs Draw was launched on the 6th of September in Pairc Ui Chaoimh, and we had representatives there on the night including our Club President Michael O’Leary. The draw is now in its 27th year with 600 prizes in 2018/2019 amounting to over €450,000 worth in prizes. The cost of a ticket is €100 for 12 monthly draws. €45 out of that €100 goes directly back to Blarney GAA, with no expenses to our club. For those interested in subscribing, you can do so online today www.corkgaadraw.ie Be sure to select Blarney as the club to ensure we also benefit from your entry. We will also be taking cash/cheques in the clubhouse over the coming weeks. Details to be confirmed on our website in the coming days. Preparations are already underway for 2019. The Annual General Meeting for 2018 will take place in November this year. Date and time to be confirmed. A number of senior officer positions will be available at this years AGM including Chairperson, Vice Chairperson, Secretary and Treasurer. For our club to continue to grow and develop, we need new faces and fresh ideas. Everyone is welcome to get involved in our club. Congratulations to our own John Murphy who won €150 in the August Cork GAA Clubs Draw. Well done to our Junior B hurlers who have reached another mid Cork final. The lads defeated Ballincollig in Coachford on the 5th of September last on a scoreline 3-16 to 0-10. Blarney face the winners of Cloughduv V Aghabullogue in mid September. On Saturday the 1st of September, Blarney / Rathpeacon, Club Na NÓg hosted its inaugural Munster U9 hurling Blitz. It was a fantastic occasion with four clubs involved with all four clubs providing two teams each. Blarney acted as hosts with visitors Kiltha Óg of East Cork, Na Piarsaigh of Limerick and Cashel King Cormacs of Tipperary. There really was a fantastic atmosphere around the club all day and the generosity of support and voluntary assistance was very evident throughout the day in the good spirit in which the event was held. Blarney/Rathpeacon would like to thank all our guests for their participation on the day and the boys from all four clubs were a credit to their communities and themselves. All the games were keenly contested and their were fantastic skills on show. There were medals and goodies for the boys who competed. Thanks to Tim Crowley from the corner shop who provided drinks and Taytos. There was great work from the U9 teams parents in providing tea and food to our visitors, around 120 children at U9 took part in this FUN Munster blitz. A special well done to Niall Hayes and his Club ns nOg team for their organisation and the work put into making this such a successful event. Good luck to Mark Coleman who is one of the nominees to win the Bord Gáis Energy U21 Hurling Player of the Year. Another first for our club! 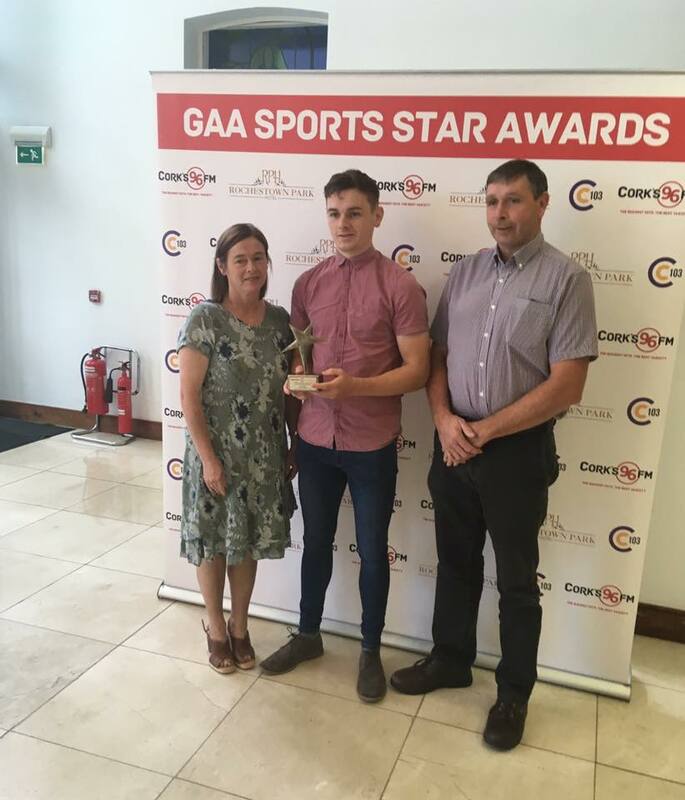 Mark has also been named the C103/96fm Sports Star of the Month of July after yet another fantastic year on the inter county stage. In early July in just a matter of three days Mark won two Munster medals, one at Senior and one at U21 respectfully. Playing a pivotal role for the senior team against Clare in the senior final, Mark won Man of the Match from centre back in that U21 Munster final v Tipperary in Pairc Ui Chaoimh. Having won their All Ireland Semi Final against Wexford they faced Tipperary once again, this time for the All Ireland Final. On the 31st of August our intermediate hurlers lost out to late Watergrasshill in Premier Intermediate Hurling Championship. Final result Blarney 1 – 12 vs Watergrasshill 1 – 14 Blarney now play Youghal in the relegation playoff in the coming weeks. Please keep an eye on our website for fixture details. We are proud to support and raise awareness around the organ donation organisation OptForLife. We now have the optforlife logo on our new club jerseys. The optforlife organisation has been highlighted in recent years by former Derry football and current pundit Joe Brolly. Please talk to your family and friends about organ donation. Well done to Daniel Murphy who won All Ireland U15 football competition on the 19th of August, beating Mayo Qtr, Offaly Semi, Kerry Final. O’Connor Park Tullamore.